Welcome back. In my unremitting search for riveting blog topics, I encountered the latest study of near-death experiences. Don’t fret if your knowledge of near-death experiences (NDEs) is limited or if you have never been, nor been acquainted with, a near-death “experiencer” (NDEr). That’s where I was when I saw the study. NDEs have been reported since antiquity. In different surveys since 1980, 4% to 15% of the population report having had NDEs. Research interest in the topic shifted into high gear following the 1975 publication of Raymond Moody Jr.’s Life After Life, a book based on interviews with NDErs, who were revived after clinical death. In 1978, researchers founded the Association for the Scientific Study of Near-Death Phenomena, which became The International Association for Near-Death Studies (IANDS) in 1981. IANDS publishes the quarterly, peer-reviewed Journal of Near-Death Studies, which began in 1981 as the semiannual journal Anabiosis. IANDS also organizes near-annual conferences. This year’s was held in Westminster, Colorado, 3-6 August. Of the many books on the subject, The Handbook of Near-Death Experiences: Thirty Years of Investigation is commonly recommended. Published in 2009, the anthology was coedited by Janice Miner Holden, Bruce Greyson and Debbie James, all faculty members at different universities. In a recently published study, researchers from the University of Virginia gave 122 NDErs a questionnaire to rate their memories of the NDE and of both an actual and imagined event that occurred about the same time. Memories of NDEs were more vivid and detailed than those of actual events, which were more vivid and detailed than those of imagined events. The results suggest that NDEs are recalled as hyperreal, not as imagined events and more real than actual events. One of the more intriguing aspects of NDEs is the similarity of what NDErs report. In his 1980 book, Life at Death: A Scientific Investigation of the Near-Death Experience, Kenneth Ring of the University of Connecticut described the core NDE stages as (1) Peace, (2) Body Separation, (3) Entering Darkness/Tunnel Experience, (4) Seeing the Light and (5) Entering the Light/ Meeting People or Figures. Ring found 60% of NDErs experienced the first stage, only 10% experienced the fifth stage. In a 1983 study, Greyson had 74 NDErs complete a questionnaire to produce a 16-item scale of clinically meaningful NDE features. The scale was highly correlated with Ring's core NDE stages, and as a multiple-choice tool, the 16 items quantified the intensity of NDEs, allowing differentiation of NDErs based on depth of their experience. The NDE study that got me started addressed the sequence of what NDErs report experiencing. Researchers from Belgium’s University of Liège and University Hospital of Liège collected freely expressed NDE narratives from 154 NDErs, who had all scored above the accepted Greyson NDE scale breakpoint. Before conducting a text analysis of the narratives, the researchers compiled a list of characteristic NDE features, drawing from Greyson, Ring and others. They identified 11 isolated features and 5 diffuse features. Isolated features occurred uniquely and could be used to establish a sequential order; diffuse features occurred throughout the narrative, making it difficult to place them in a sequence. In assessing the sequential order, the researchers considered every sequence of two and more consecutive NDE features. 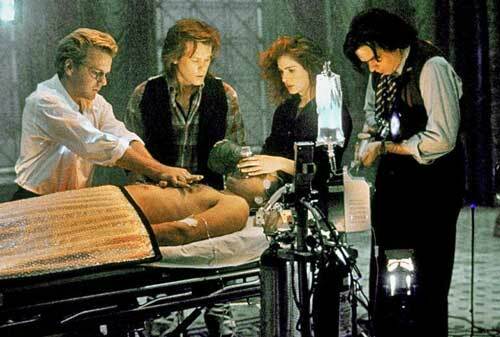 For example, 47 narratives contained Out-of-Body Experience and Encountering with Spirits/People; of those, 91% reported Out-of-Body Experience first. 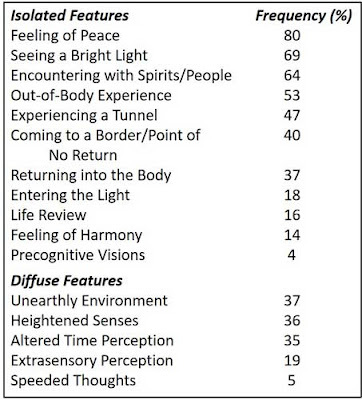 The most frequently reported sequence of four consecutive NDE features was Out-of-Body Experience, Experiencing a Tunnel, Seeing a Bright Light and Feeling of Peace; however, only 6 of the 27 narratives that had those 4 features had them in that order. The analysis found an average of 4 isolated and 1 diffuse feature per narrative. 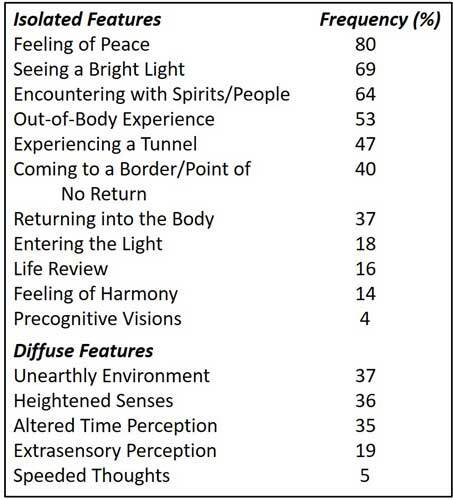 The most frequently reported feature was Feeling of Peace (80%), while the features most frequently reported first and last in the narratives were, respectively, an Out-of-Body Experience (35%) and Returning into the Body (36%). Though NDEs share many of the same features, their sequence appears to vary with the individual. Overall, for me, the topic is one I’m no longer inclined to write off entirely as someone’s still active imagination. What do you think? Thanks for stopping by.